We are happy to report progress in our work on agriculture in Africa. The Agriculture and Land Policy Simulator (ALPS) model now includes an explicit treatment of water: rainfall, irrigation, water resources, and their effects on crops. Funded by our partners at Mohammed VI Polytechnic University (UM6P), our Climate-Smart Agriculture Project aims to influence how agriculture develops in Africa in the face of climate change, by creating tools for policy analysis, education, outreach, and thinking. Last fall, when we released ALPS version 1.1 and adapted it to Morocco, our partners at UM6P helped us understand how important water resources are to their national circumstances. One general insight from that conversation is that every country faces a unique set of limitations that must be addressed to develop agriculture along a climate-smart path. Such limitations might include infrastructure, deforestation, soil degradation, water, or other factors. But to address the specific case of Morocco, we made several improvements to ALPS. First, because water is a local resource, we decided to add regional functionality – the national-level model can be split into zones that may vary by rainfall, water resources, crop mix, farm practices, etc. In Morocco, there are six climactic zones that had been previously defined to make agriculture projections. Other country models could include whichever divisions are helpful for policymakers and stakeholders. The second improvement to ALPS was making explicit how water availability affects crop yield. After several trials, we settled on a water deficit formulation by Doorenbos and Kassam. We estimated a value for the amount of water required for optimal crop yield in each zone, based on the area planted for five main crops, along with observed temperature and its impact on evapotranspiration. We built a simple structure for inputting annual rainfall with historic data and future scenarios for each zone. For Morocco, past rain is calculated using the “Tropical Rainfall Measuring Mission” satellite data for geographically defined areas for each zone. Future rain is based on optimistic and pessimistic scenarios from the MOSAICC climate model, but it is possible to use any rainfall projections. Finally, we have a simple model of water resources. It includes a stock of water (reservoirs and aquifers), along with infrastructure and technology that determine irrigation coverage and efficiency. 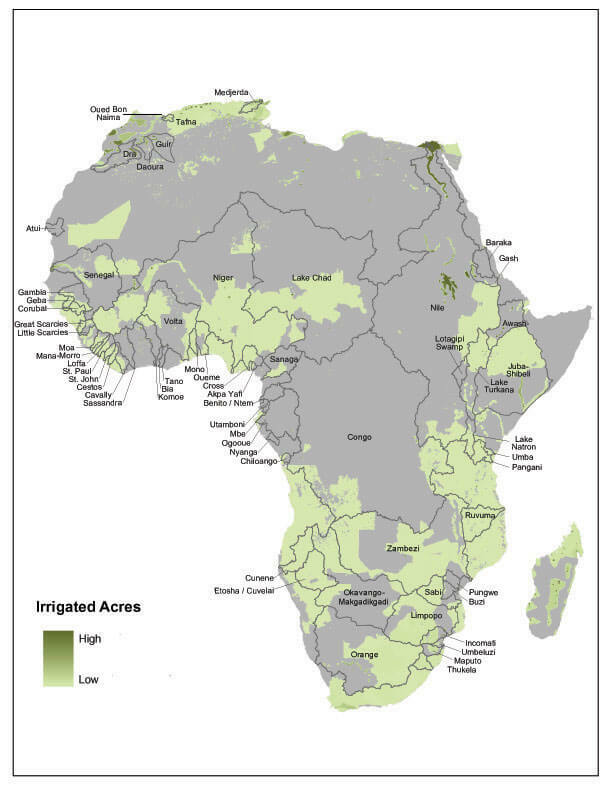 Irrigation can make up for rain shortfall in areas with infrastructure coverage, and allow for higher-yielding but more water-sensitive crops. 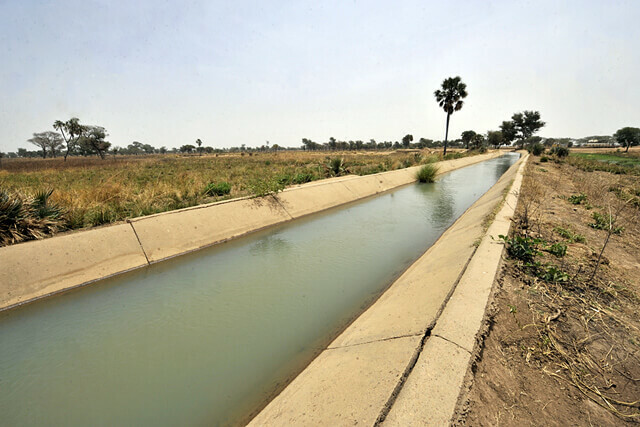 The water stock does limit how much is available for irrigation, while measures like drip irrigation can increase the effect of what water is available. The net result of these improvements is shown in the figure below. 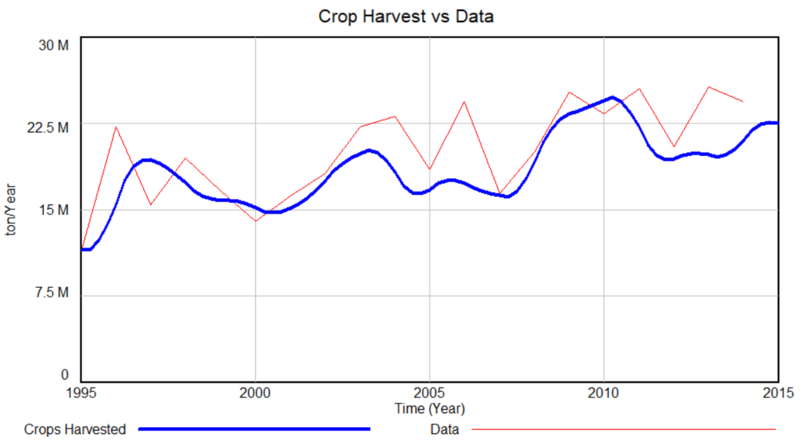 The blue line is the total crop harvest calculated by the model, in tonnes per year, compared to the reported data shown in red. The simulator now has explicit dependence on water, and it is also possible to see the fluctuation with year-to-year weather. We can begin to see how resilience to climate change might be measured. As in all system dynamics models, we recognize that improvements are always possible, and we are looking forward to connecting with stakeholders and experts who can help us improve our understanding. Still, we have made important progress. We can now see how production varies with rainfall and how variability can be mitigated by efficient irrigation from sustainable water resources. Future improvements are possible, including how livestock are affected by and in turn affect demand for water, and the different dynamics of reservoirs and shallow and deep aquifers. We are constantly improving our models and looking for partners that can help us and make use of our thinking. As we continue to develop the Climate and Agriculture Policy Simulator we will concentrate on details that make the tool most useful for policymakers and others. To contribute or make suggestions, contact Travis Franck.